Curtain Rods, Drapery Rods and Traverse Rods along with all the hardware including decorative finials, brackets and rings offered from budget priced to luxurious higher end designer curtain rods. You will also find wood curtain rods, extra long drapery rods, double and short curtain rods from every major manufacturer all at unbeatable discount prices. 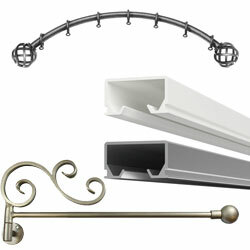 This entire offering of decorative curtain rods and drapery rods all in one place. 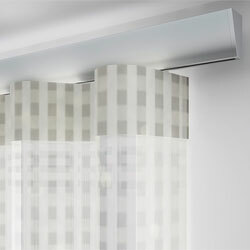 Scroll through the modern to traditional curtain rods in metal, bamboo, crystal, wood, wrought iron, brass and stainless steel. 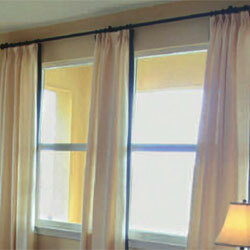 Basic and heavy duty curtain rods in single, double and triple configurations to tension rods, bay window rods, corner rods, sash and cafe rods to clear rods including extra wide and shower curtain rods. 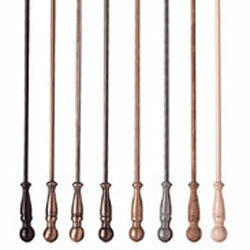 Traverse rods are functional rods with a cord or wand for drawing the curtains or draperies. 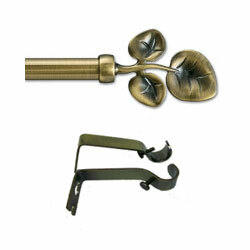 Shop for standard and decorative traverse rods, heavy duty traverse and flexible traverse rods and hardware. Specialty curtain rods for special needs includes: ceiling track and cubicle curtain track, flexible and arched curtain rods, swing arm and crane rods to tapestry rods and wire curtain rods and magnetic rods too. 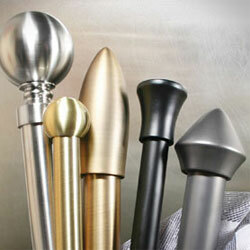 Traditional wooden curtain rods and wood poles and finials - choose from standard finishes, custom colors and unfinished wood. All sorts of curtain rod parts, hardware and accessories including; curtain pulls and batons, brackets, rod elbows, grommets, traverse cord, tie backs, swag holders and more. 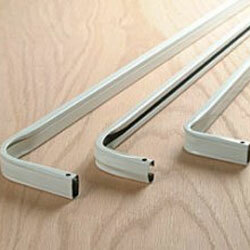 Curtain rings for completing your curtains and drapes. 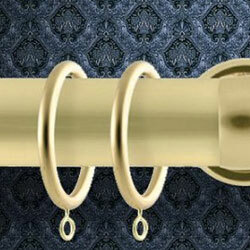 Shop large curtain rings, black curtain rings, metal rings and eyelet rings. 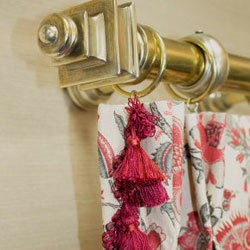 Choose curtain rods by manufacturer from leading brands such as Graber, Kirsch, Casa Valentina, Menagerie, Paris Texas Hardware, Fabricut, Robert Allen, Brimar, Finestra, Kasmir and Vesta along with others. These decorative curtain rod sets in metal, wood and wrought iron offer traditional and contemporary looks in affordably priced sets that have been combined with finials and brackets with optional curtain rings. 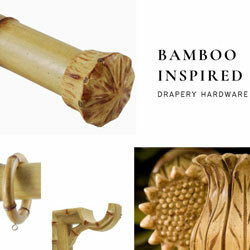 For that tropical look these bamboo curtain rods should do the trick with this offering of bamboo rods in 3/4" up to 2" in diameter with a variety of finials, bamboo wall brackets and bamboo curtain rings. 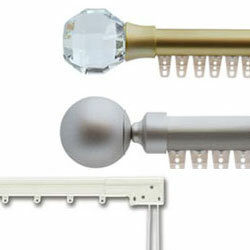 These crystal curtain rods will add that sparkle to your decorating look with curtain rods and hardware that offers an affordably priced crystal look to Swarovski crystals to high end hand cut leaded glass finials. These decorative metal curtain rods offer traditional, contemporary and outdoor collections in steel, brass, iron, stainless steel and wrought iron with coordinating hardware including finials, brackets and curtain rings. Iron curtain rods with smooth to twisted poles in sizes from 1/2" to 1 1/2" are combined with hand forged wrought iron finials, iron curtain rings with eyelets and brackets in affordably priced sets to finer designer lines. Decorative brass curtain rods in contemporary to traditional styling are offered in 5/8" to 1 1/8" diameters in reeded, smooth and roped styles for curtains and as sash rods with brass curtain rings and brackets. These decorative outdoor curtain rods offer corrosion resistance with their stainless steel and powder coated finishes on the poles, finials and brackets that have been designed for outdoor performance against the elements. 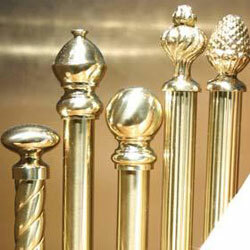 This trend setting offering of decorative curtain rods offers modern and contemporary styled finials, brackets and curtain rings for kids to sophisticated cutting edge designed sets that offer unique designs not found anywhere else. The traditional curtain rods are offered in choices ranging from wrought iron, stained or painted and unfinished wood, brass and metal as well as resin finials in a wide variation of classically traditional designs. The small curtain rods and sash rods offered in this selection range in size from 1/2" in diameter to 1" in diameter and feature looks in a variety of styles from modern to traditional, in brass, wrought iron, crystal and metal. The medium sized curtain rods is the largest decorative curtain rod selection, offering sizes from 1 1/8" to 2" diameter, in modern, contemporary and traditional designs with finials, brackets, curtain rings and hardware. This selection of large curtain rods is where the big boys are, with curtain rods in sizes from 2 1/4" in diameter to a large 3" in diameter in choices from unfinished wood to rich stains and gorgeous painted designer colors. When covering large windows or groups of windows, this selection of extra long curtain rods offers 160' uninterrupted track to traversing drapery rods in 26 foot lengths and rod splices to make rods longer and more. Tips and Tricks for hanging and restringing drapery rods or converting to one way, frequently asked questions, installing instructions, how to create an extra long rod, how to measure windows, other useful do it yourself tips. Your Curtain Rod Store and Drapery Rod Store where you can shop and buy from a huge selection of curtain rods, traverse rods, drapery rods and hardware accessories in different materials, sizes, shapes, styles, colors and finishes. This decorative curtain rod and decorative drapery rod section features an expanded easy way to search for a specific type of curtain rod. The first choice is the curtain rod collections, which offer every type of decorative curtain rods in one place, so you can view them all together. 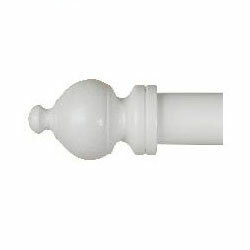 Then a selection of curtain rod sets are offered which has budget priced ready to go curtain rod sets with brackets and finials. 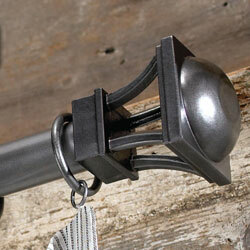 Next are decorative traverse rods that are designed for ease in opening and closing your drapery. 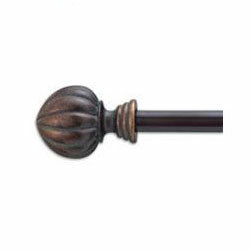 Decorative wood curtain rods are a popular choice with sizes of 1 3/8", 2" and a range of other diameters up to the beefy 3" wood curtain poles, which have coordinating finials, brackets and curtain rings, with a mix of other hardware accessories. 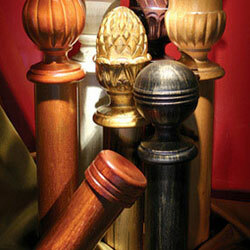 Wood finials in this curtain rod selection offer classic traditional designs as well as modern looks. 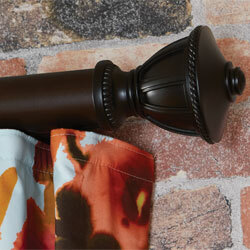 The wood curtain rods are offered in stains that enhance the beauty of the wood, to a range of gorgeous decorative colors, as well as being available unfinished for those wanting to do their own unique design touch. Bamboo curtain rods in a variety of sizes from 3/4" to 2" with bamboo finials, brackets and bamboo curtain rings are featured in several designer colors as well as natural. For a sparkling look, gleaming and shiny crystal curtain rods will do the trick, Metal curtain rods are offered in a number of different ways, from: wrought iron to brass and steel as well as stainless steel. Speaking of stainless steel outdoor curtain rods we offer that, along with powder coated curtain rods and hardware that has been designed for outdoor use to withstand the elements. 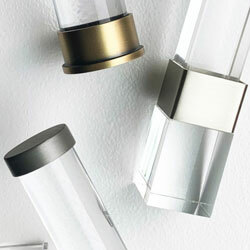 You can also find your curtain rods by style with choices in modern and contemporary to a classic traditional look. 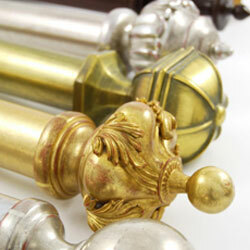 Search for your decorative curtain rod by size, with choices of small, medium and large. Now there is large and there is extra long, with tracks being available in one continuous uninterrupted length of 160' and typical traversing drapery rods being offered, to extra long drapery rods in 26 foot lengths. 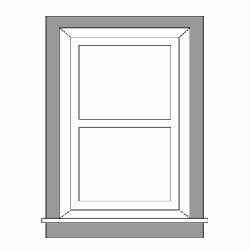 If you need to know something about curtain rods there is a helpful how to guide which gives tips and tricks and answers frequently asked questions. The decorative curtain rod selections feature a number of major manufacturers that include Graber Curtain Rods and Kirsch Curtain Rods along with other budget lines for affordable decorating, as well as higher end designer curtain rods. 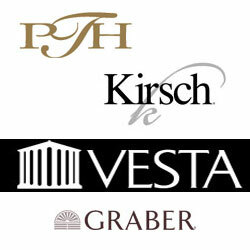 Among those other rod offerings, major companies such as Casa Valentina, Paris Texas Hardware, Robert Allen Curtain Rods, Vesta Curtain Rods, Finestra Curtain Rods, Kasmir Curtain Rods, Menagerie Curtain Rods and Fabricut Curtain Rods are represented among others. 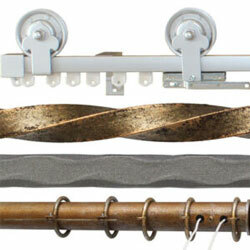 The curtain rods offer coordinating hardware and accessories which includes: brackets, finials, curtain rings, tiebacks and other decorative hardware. Also included are wrought iron curtain rods and ceiling curtain rods or track as well as decorative rods from modern and contemporary to traditional. Our selection of specialty rods include tension, swing arm rods, double and triple curtain rods, curved and corner rods as well as motorized curtain rods. If you have questions about any curtain rod, drapery rod, traverse rod or hardware accessory please call or email one of our knowledgeable customer service representatives for help.